Laboratory of Cell and Molecular Biology, Department of Botany, University of Calcutta, Kolkata- 700019, West Bengal, INDIA. Introduction: Diabetes Mellitus is a metabolic disorder with high blood sugar level. Type 2 is the common form. The herbal remedies for diabetes treatment is an area of research with a huge potential for the progress in the growth of inexpensive alternative medicine with low or no side effects. 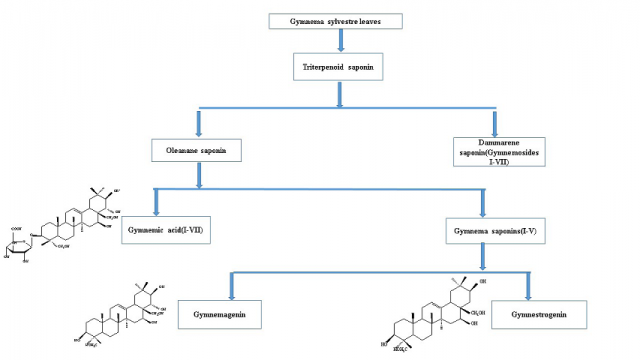 In this paper, reviews mainly focused on traditionally used medicinal herb, Gymnema sylvestre and its bioactive components and their mode of actions. Method: Relevant information was collected from scientific journals, research papers, books and various medicinal reviews. Result: This review provides a comprehensive report on Gymnema sylvestre having antidiabetic and antioxidant activity due to its bioactive compounds like oleanines (gymnemic acid, gymnema saponins), dammarenes (gymnemasides), anthraquinones, flavones, hentriacontane, pentatriacontane, phytin, resin, tartaric acid, formic acid, butyric acid, lupeol, β-amyrene related glycosides and anthraquinones, alkaloid like gymnamine, flavonoids, cinnamic acid, folic acid, ascorbic acid etc. Conclusion: Considering the presence of bioactive compounds present in Gymnema sylvestre, this review is aimed to summarize the information of the chemical constituents and their antidiabetic activities and specially to detect the relation between antioxidants and antidiabetic compounds regarding blood sugar reduction in diabetes. Laha S, Paul S. Gymnema sylvestre (Gurmar): A Potent Herb with Anti-diabetic and Antioxidant Potential. Pharmacognosy Journal. 2019;11(2):201-206.